(MP153). Alma Claude Burlton Cull (1880-1931). 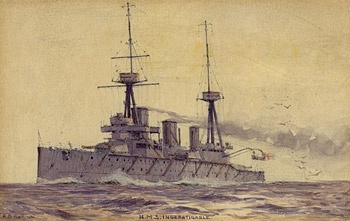 Watercolour signed and dated and annotated (LC) HMS INDEFATIGABLE. Although Cull has finished the painting to the extent that he has put his hallmark “box” around his signature the overall impression of this watercolour is that it is not totally complete. Cull loved the finest of detail, the subtleties of light and wave patterns and although this charming little watercolour does not boast these it remains nevertheless very attractive. MP148 on this website ( HMS INDEFATIGABLE at Cowes 1912) gives details of the short career of this unfortunate battle cruiser. But in 1912 when she was brand new Cull, together with Dixon (MP148), were obviously keen to have her in their portfolios and we see her with a fore funnel already lengthened and torpedo net booms still fitted. The port seaboat is turned out.